It seems every fashion girl has stepped out recently in one this season's most popular colors: brown. But this polarizing hue isn't the only color that's cropping up among the street style set. We noticed that a slew of fashion A-listers gravitated toward red as well (not to be confused with the other It shade of the moment—rosy pink). While red in all shades—we're talking burgundy, cherry, and crimson—has always been in, the hue is making a more meaningful fashion impact this fall in particular. We've seen women testing out bright red dresses with their ankle boots and jackets, trying pants and tops in the color, and incorporating a pop of the hue in their accessory game. Go on to check out how our favorite fashion people are wearing red right now—and get inspired to wear more of the hue this season. Plus, go a bit further to shop some of our favorite red pieces of the moment. Red stirrup pants? So forward. 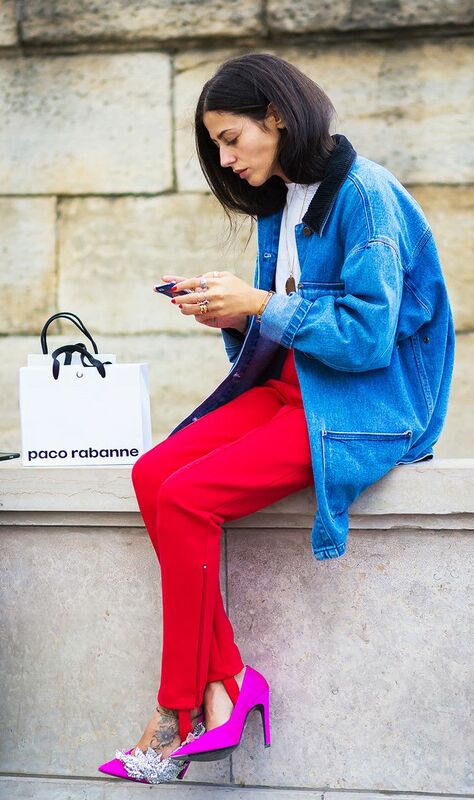 We love the subtle pop of red on her turtleneck—mixes perfectly with her J.W. Anderson bag. Red and khaki is the perfect color combination. The simplest way to test out the trend? Try a chic red bag! We're so into how she coordinated her sweatshirt with the side stripe of her pants. Red pants may seem bold, but you can totally pull it off—even with just a simple tee and unique tank. Red boots? Now that's a statement. If you really want to go for it, try an all-red dress. Caroline Issa's bag is sophisticated—and we love the pop of red against her white jacket. Every fashion girl will wear puffers this winter. Looking for the easiest way to look cool and stay comfy? Slip into It girl–approved track pants. Because your basic black booties deserve a break sometimes. Try this instead of your standard clutch for a night out. These are the new Stan Smiths. This coat looks way more expensive that $129. Button-down skirts aren't going anywhere. Wouldn't you love to wear this to the office? How can you not love this whimsical bag? We'd pair these with skinnies and a cool moto jacket. Check out the #1 color for 2017 right here.